$$2012^2=a^2+b^2+c^2+d^2+e^2$$ with Mathematica but the computation takes minutes; I might be doing something wrong. I get an immediate result. It does not seem surprising that a search space 2000 times larger results in a substantially longer computation time. As it happens, I wrote code for this sort of thing a couple of months ago. Am hoping to put it into Wolfram|Alpha some day. This might be no faster than what you did, though. How to obtain a fixed number of solutions to $x+y=1$? 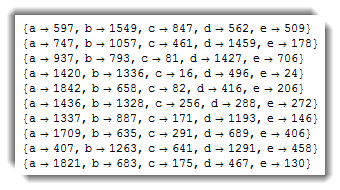 FindInstance (and Solve, …) abysmally slow on a fully determined system of linear equations and inequalities: why?